I was enjoying my freshly brewed morning coffee as a friend of mine arrived at the office. We had a long chat about Kicad and Eagle. These are two popular applications for designing circuit boards. I have been a long time Eagle user. But in the coffee roaster project I’m hired to work on, they use Kicad. So, I had to switch. It was surprisingly easy to switch. And I kind of liked Kicad. 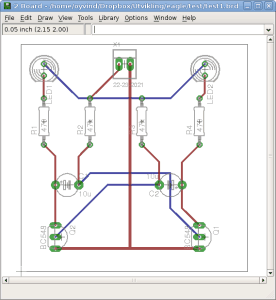 Kicad is a free open-source software that is developed by volunteers. Eagle is a commercial software owned by Autodesk. But free for hobbyists and students. At the end of our conversation, I concluded that I think I will be using Kicad for my future projects. After 8 years of service, it was time to retire my old Dell laptop. I’ve always been a PC guy. But I decided that this time I will buy a Mac, and see for myself what all the fuzz is about. To make a long story short – it turned out Kicad was unusable on my new Macbook Pro 13 inch! It just runs really slow. So I had to use my old Dell laptop to work on the coffee roaster project! During the last week, more issues have come up with Kicad. I’ve always found a way to work through them. But it’s left me with this feeling that maybe I should stay with Eagle. I’m thinking that since Eagle is a commercial software they will use more resources to make sure there are no issues that might drive customers away. I’m gonna design another project in Eagle soon. Then I’ll write an article with my conclusion. But the good news is that it was very easy to switch from Eagle to Kicad. I’ll let you know when the article is out. You should check out Tinkercad. They just turned on electronics Tinkercad.